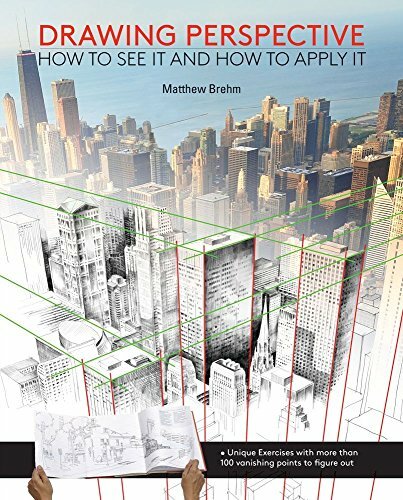 There are many books on perspective drawing and each one caters to a different type of artist. For this particular book, I think it's targeted at people who draw on location because most of the examples featured are those drawn from location. However, you can use the concepts to create your own scenes and elements in perspective too. The book covers five types of perspective, namely 1-point, 2-point, 3-point, multi-point and curvilinear. And lastly there's the workbook section with 32 pages of perspective grids for you to practice drawing on. Each chapter is huge and is broken down into helping you identify the different types of perspective, understanding them, and how you can apply them yourself to your drawing. The instructions are clear and easy to follow. The writeup is informative and in depth. There are lots of wonderful illustrated examples contributed by artists over the world, included the author Matthew Brehm himself. It's a practical guide actionable techniques you can try out for yourself. If you've always found perspective to be challenging, this is a good straightforward book to demystify this subject for you. After you've learned the techniques, this book is still worth revisiting for the beautiful sketches included. By the way, there are different publishers for this book. The book I have is published by Page One, the other publisher I know of is Barron's Educational Series. Content should be the same. The book's a 144-page paperback. Just wondering, there are so many perspective books, which one would you recommend for urban sketching? /(specially indoor scenes). This book by Matthew Brehm is good. I don't think you can go wrong with it.